The cultivation of pears goes back some 4,000 years. It is likely that they originated in the Caucasus region from where they spread west to Europe and east to Asia. In Ancient times the pear was considered superior to the apple and outnumbered it in varieties grown. The Greek poet Homer considered the pear God’s gift to humanity. 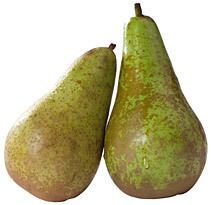 Pears are usually picked when slightly under-ripe and they improve in texture and flavour after picking. Ripe pears have an inviting fragrance and yield to gentle pressure at the stem end but slightly firmer pears are usually preferable for use in cooking. Pears are an ideal weight loss food, 98% of their energy is from carbohydrates, which contain half the calories of fat. They are good sources of the B-complex vitamins and also contain vitamin C; in addition, they contain small amounts of phosphorus and iodine.